Thank you, very much for supporting me as a designer; agency and author. Subscribe here to get a free chapter of "V.I.P Various Imbecile Protected." My book will be available from Amazon.com; Barnes & Noble; Borders and all major bookstores September 2010. This exclusive look will give you the scoop on what's to come hahah. Get one Chainlinx glasses holder; get a free StuddedSpikes ring. You decide: Silver or gold ring! 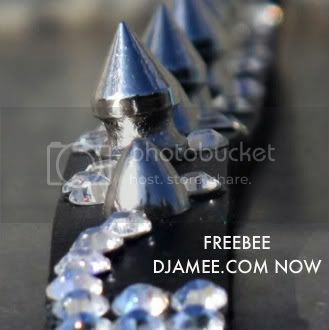 Get a Diamondlinx necklace/collar and you get a Lovelinx and StuddedSpikes ring Free! This offer is valid only until Wednesday March 24th 2009. Act now and get your freebees. Make sure you go to the Freebees form here to start getting your freebees. Next week I will have free tickets to BKFW happening April 11Th.